IARTS team commits to household art decoration ideas, innovation, production and excellent customer service. Our every artist has his own unique style, under the brand center of IARTS always focus on a new generation of unique creative works of art.Our team have regular conference to study household style and discuss the evolution wall art of the trend,to rich atmosphere color and good painting technique.The application of the latest color and style into IARTS work is the key to its success. Artist Bio. :The artwork copyright base on ARTMARKTETING,Anyone cannot use the brand before getting consentment,or the consequence is proud. CANVAS WALL DECOR - Perfect wall decorations paintings for living room, bedroom, kitchen, dining room, study, office, dormitory, restaurant, hotel, bar or other wall decor etc. You can hang it on walls, above bed, sofa, TV etc. or put it on mantel, credenza etc. Stair wall is also a perfect place for our wall arts. HAND MADE - IARTS provides wall arts 100% Hand Painted by professional's artists on high quality canvas with a blending of true colors in the brush strokes and textures. Each painting is unique and it is not a giclee print poster. High quality acrylic and cotton canvas is used for creating our wall arts. GIFT IDEA - Perfect for birthday, Valentine, business gift, Mother's or Father's Day, Thanksgiving, Christmas and New Year, wedding, move-in, birthday or other specially occasions for your family, friends, colleagues or business partner and more. One great and meaningful gift that people can keep for decades. PAINTING & DECAL THEME - Modern contemporary abstract acrylic oil canvas painting. 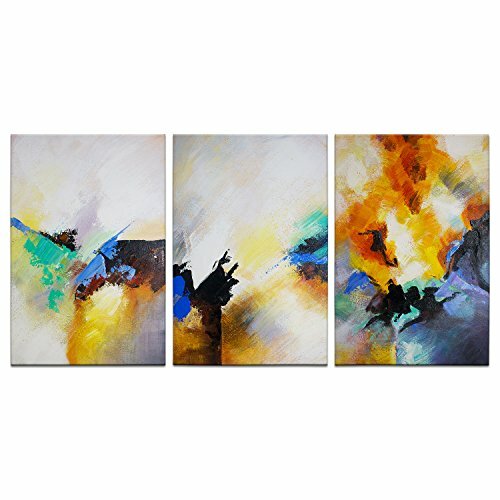 This set of 3 wall art will light up your place and redefine your living style. It is ideal for interior design styles like modern, simple, exquisite, city, European, oriental or typical America style and more. PAINTING SIZE - 24 X 48 inches in total (60 X 120 cm) large size stretched with wood frame. 16 X 24 inches (40 X 60 cm) for each small panels. Painting wrapped with accessories and easy READY to HANG. Each canvas art can be personalized made, if you want other size, please contact ART.HOME. If you have any questions about this product by IARTS, contact us by completing and submitting the form below. If you are looking for a specif part number, please include it with your message.